ABOUT CAMP Why is your program two weeks long? Studies show that one of the greatest gifts of a quality camp experience is developing supportive relationships. Our past experience has shown us that a longer program helps relationships to develop and stick in a meaningful way. Can campers sign up for more than one session? Yes, if space is available. Is each session the same? Or are there different themes or activities? Summer themes are the same for every session. However, each session’s Pod Groups create a unique and different experience for the campers. We have many campers who enjoy attending more than one session each summer. What is a Pod Group? During the session, each camper belongs to a “Pod Group” of same gender and similar age children. The Pod Groups are designed for optimal friendship and skill building, and consist of 6-8 children with one counselor. Larger pods of 10-12 campers will have a second co-counselor to guide them. An additional activity leader will accompany Pod Groups for adventure activities such as archery or the climbing wall. Can my child request a friend to be in his/her Pod Group? Yes, campers may request to be with up to two friends of similar age and gender. Request must be mutual and are not guaranteed. ECDC will take special care to ensure all campers have an opportunity to make new friends, as well as deepen relationships with existing friends. Friend request forms are due one month prior to start of session. Are there activities that are held offsite? Yes. In addition to onsite activities, campers will have the opportunity to gain skills through offsite horsemanship, hiking and nature exploration, Dana Point tide pools, and weekly beach days. These trips are supervised and supported by program staff and Pod Group counselors. Campers will be transported in 15-passenger vans by Class-B licensed staff or by chartered school buses. With the full staff on hand for beach days, the overall ratio of staff to campers is 1:3. In addition, we remain right in front of a CA State Lifeguard Tower. 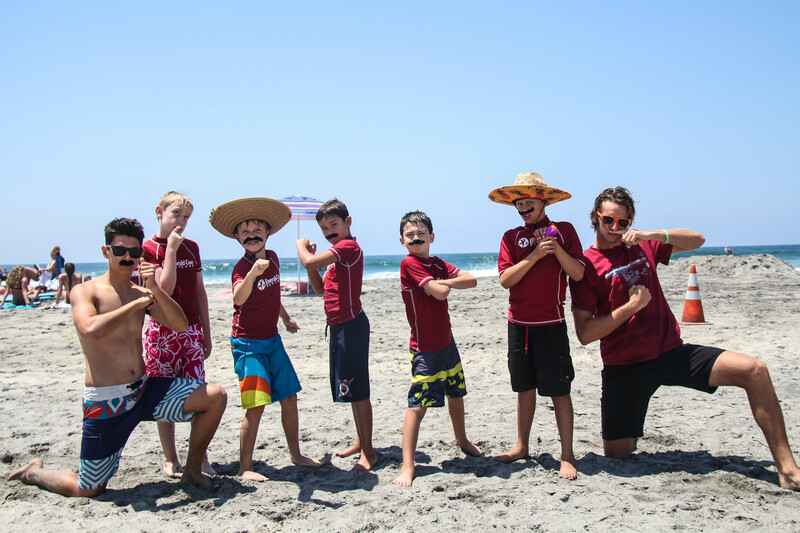 Each camper wears a required ECDC rash guard, and is provided with an opportunity for safe, supervised sand play and waist-deep water play. All water play is appropriate for even the least experienced swimmers. Closely supervised wave play is appropriate for our more advanced swimmers. If your child uses a booster seat, please label it and leave it at check-in for our use on these offsite days (see the parent hand-out you receive at the start of session). Off-site outings occur 2-3 times a week. Regular drop off and pick up times apply. These trips are among our campers’ most memorable experiences of the session. What if my child takes medication during the day? At the start of each session, we will collect camper medication (which must be in original packaging) and store it safely. Distribution of daily medication is overseen by ECDC’s Health Supervisor. My child sunburns easily. Your camp is outside, so how will my child be protected? ECDC counselors are trained to make sure each of their campers has an active layer of sunscreen on throughout the day and provide supplementary high quality sunscreen for campers use. We also spend much of our day in the shade and make sure that all campers are properly hydrated at all times. We recommend that campers apply sunscreen before arriving at camp and bring a hat with a wide brim. How do you handle medical emergencies? ECDC’s onsite Health Supervisor handles minor bumps and scraps at camp. An “Ouch Report” will be provided to parents at pick up should 1st aid attention be required by a camper during the day. If a more significant illness or injury occurs, parents will be contacted immediately and emergency personal called if necessary. How does ECDC handle discipline issues? ECDC’s program is designed for well-adjusted children who are learning to treat each other with respect and who can grow to value each child’s right to a fun, enriching camp experience. Clear guidelines, positive reinforcement, strong role modeling and a consistent sense of teamwork and fair play are key components in our effort to maintain a safe and nurturing camp environment. We work hard to help every child develop greater social skills and to succeed in the camp community. Disrespectful, mean or violent behavior, including teasing, isolating or harassment of any kind is not tolerated. If discipline problems arise, we handle each issue on an individual basis. In most cases, we will clarify expectations, discuss unacceptable behavior, and determine relevant consequences. If misbehavior continues, a meeting with camper, parents and director will result. A behavior contract may be drafted. Broken behavior contracts will result in the camper being sent home and not returning for the remainder of the session with no tuition reimbursement. How does ECDC handle conflict between campers? Young children need guidance and practice when learning friend-making and friend-keeping skills. Our staff is poised to shape camper behavior if disagreements occur. Our usual protocol involves listening to each camper’s story, calming their frustrations, helping campers understand each other’s point of view and finally working together for a solution or more acceptable response. When conflict continues or escalates, parents may be consulted for further strategies in order to help each camper experience successful conflict resolution. Describe the “Christian nurturing” at ECDC. At ECDC, we long for campers to understand that they are deeply valued by God simply for who they are, not for what they have or what they do. We teach about the love of God and His guidance of how to treat others through songs, devotions, role modeling and teachable moments. Campers will be guided to reflect on their behavior and to make good choices in order to create a loving environment of acceptance and growth. May I speak to a family who’s participated before? Yes. In fact, we encourage it. We would be more than happy to connect you with a family (or families) so that you may ask any questions you have directly of them. Please contact our office for referrals. ABOUT REGISTERING FOR CAMP What are your age requirements? ECDC serves campers 5 years (entering Kindergarten) to 10 years (entering 4th grade) of age. Where is your camp held? Emerald Cove Day Camp is held at Ambuehl Elementary School in San Juan Capistrano. What does camp tuition include? Camp tuition is all-inclusive. It covers 6 hours of our supervised program for 10 days, including all activities and supplies, field trips and camp rash guard. Campers are required to bring a lunch. What is ECDC’s refund policy? If cancellation occurs 4 weeks or more prior to the start of the session, tuition is refundable less a $250 cancellation fee. If cancellation occurs within 4 weeks of the start of the session, tuition is not refundable. ECDC makes a single exception to this policy for campers who have a sudden illness or medical emergency that can be verified with a doctor’s note. Any daily absences are not refundable. If a camper is sent home due to behavioral issues, tuition is not refundable. Are there any deadlines I need to be aware of? A deposit of $250 is due upon registration. Tuition balance and camper forms are due 4 weeks prior to the start of session. Can I be notified if there is an informational gathering in my neighborhood? Yes, please advise the ECDC office of your interest in a Parent Coffee and provide your address. We will contact you with the dates and times of information gatherings in your area. Clothing – comfortable play clothes that can get wet and dirty. Campers should wear a bathing suit under their clothing or pack one each day. A bathing suit and ECDC rash guard should be worn for beach days. Does ECDC provide lunch/snacks for campers? Due to the specific tastes of each camper, as well as the growing number of dietary allergies, ECDC does not provide lunches or snacks for campers. Campers are to bring a healthy snack and lunch daily, and are encouraged not to share their food. ECDC does provide plenty of water and frequent water breaks are taken to ensure healthy hydration. Tell me more about your staff selection. What are your criteria for hiring? ECDC’s senior staff is comprised of youth development professionals and collegians. Pod Group Counselors must be entering or already in college. Our Volunteer Counselor Team is made up of high school students entering their sophomore through senior years. All of our staff goes through a rigorous screening process, which includes interviews, reference checks and background screening (if 18 years and older). Staff are then selected based on social and emotional maturity, youth work experience and communication/activity skills. We are proud that we have a high rate of returning staff each summer with some counselors also serving at our sister camp, Yosemite Sierra Summer Camp at Bass Lake. What training does your staff receive? Training is provided in a variety or areas including child development, behavior management, activity leadership, role modeling, effective affirmation, devotion series training and emergency preparedness. All staff are CPR certified. Pool staff are lifeguard certified, 15 passenger vans are driven by senior staff and carry class B certified licenses. Will we hear from ECDC after camp is over? Yes, in order to understand more fully ECDC’s impact on our campers and to strive for improvement, we will provide families with a satisfaction survey to complete shortly after their session is over. Over the fall/winter months we will keep you apprised session dates and Early Bird discounts. We will also invite interested families to host Parent Coffees to share ECDC with their friends. We also send out our monthly blog “Camp-to-go” via email, and you can find the archive here. Finally, in conjunction with sister camp Yosemite Sierra Summer Camp, ECDC will periodically offer Parent Workshops on topics relating to growing character, skills, relationships and faith. These 1-hour interactive sessions are a fun way to bridge family and camp environments as we work together to shape the lives of children.